In order to inject a bit of Southern flavor, Amos chose to record in Shreveport, Louisiana at the studio of Brady Blade, who’s featured on drums and percussion, along with other locals including Chris “Doctor” Roberts on electric guitar, Chris Thomas on bass, Hassell Teekell on B3, Lewis Smith on trumpet, and the gospel ensemble Forever Jones on backing vocals. Joining this ensemble from the West Coast is Mindi Abair on sax, Anthony Marinelli on keyboards, and of course Amos on vocals and harmonica. If you recognize any of these names you’ll no doubt realize there’s a very high level of musicianship involved, built on a strong foundation of jazz and R&B, which allows for lots of twists and turns throughout. 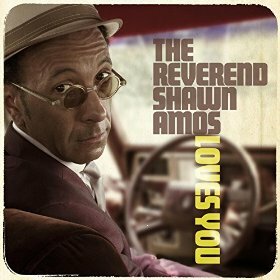 On The Reverend Shawn Amos Loves You, the good Rev proves he’s no jack-leg blues preacher, but the real deal – well-schooled in both traditional and contemporary styles. With engaging songs, soulful back-up singers, and a honking R&B horn section, he delivers a blues sermon about love and life lessons that will lift your spirits and empower your body to get down and groove to the music. This entry was posted in Blues and tagged Shawn Amos, The Reverend Shawn Amos Loves You by aaamc. Bookmark the permalink.